The Palas® condensation particle counter (ENVI-CPC) is a purpose built CPC for environmental ambient air monitoring that is available in two models, each of them optimized for a specific concentration range. Model 100 is created for lower air particle concentrations, whereas the model 200 is appropriate for higher air concentrations. 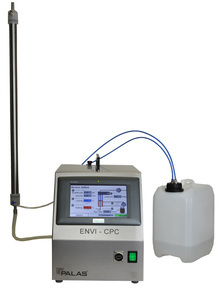 The ENVI-CPC offers single particle counting up to 2,000,000 particles/cm3, and can be used for ambient air monitoring without a dilution system. The condensation process makes nanoscale particles measurable. In addition to quantity, the ENVI-CPC also measures the droplet size of the condensed particles, thus providing additional information about the condensation process. The ENVI-CPC is equipped with an isothermal Nafion® aerosol dryer that has no consumables and can be used for months without maintenance. The humidity of the aerosol at the inlet is measured and controlled. Additionally, it has a second pump for the working fluid in order to deliver it from of a large butanol reservoir. Due to this feature, the device can operate for months without the need for refilling the fluid reservoir.